I remember reading about how superconductors were to revolutionize transportation, computing, telecommunications, energy and industry. 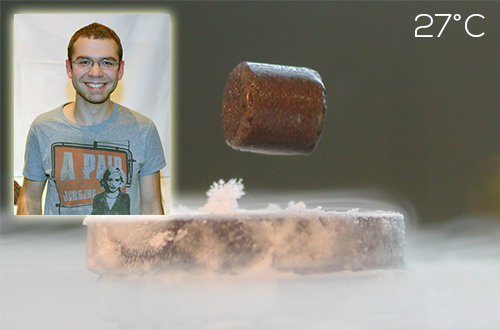 I also remember with amazement the time I made a superconductor float on a magnet in a pool of liquid nitrogen. That was cool, both figuratively and literally, as the temperature of the superconductor dropped to −196 °C (77 K; −321 °F). And that day I realized that the promises of superconductivity were more of science fiction than everyday reality. But things are about to heat up as European scientists led by R. Mankowsky, from the Max Planck Institute for the Structure and Dynamics of Matter in Hamburg, Germany, were able to achieve superconductivity at room temperature, albeit for a few millionths of a millisecond. Rather than pouring on the liquid nitrogen or liquid helium, they instead shot the material with high-powered lasers. While at first glance it would just show how superconductors are only fit for geeks with lab coats to play with, it demonstrates that it is indeed possible for superconductors to operate at ambient temperature. The research team was able to do this with a material called yttrium barium copper oxide or (YBCO). Like the Village People song, the YBCO crystal is special because of its structure. It has thin double layers of copper oxide that make superconductivity possible as it allows electrons to form Cooper pairs. These double layers alternate with thicker intermediate layers containing barium, copper and oxygen. Previously, the material only became superconducting when it was cooled to “critical temperature”, typically at the boiling point of liquid Nitrogen. When the material gets “warmer,” say like at water’s freezing temperature, the materials is as useful as a lump of clay. You can probably form it into the word YMCA. But what the scientists did was hit the YBCO with infrared laser pulses to make it superconducting at room temperature. The laser heated up certain atoms in the crystal, causing the excited atoms to oscillate. Not only did they get excited, as with anything in heat, they also moved and shifted their position in the crystal. This shifting is what caused the material to become superconducting, even at elevated temperatures. This finding furthers the theory of high-temperature superconductors. Hopefully this will make room temperature superconductors fly, not just figuratively, but literally as well.